There are huge and growing problems in the Great Lakes. Water use is growing at a rate double that of the population, and we now know that by 2030, global demand will outstrip supply by 40 per cent. Lack of access to clean water is the greatest killer of children by far. So we who live around the Great Lakes of North America have a very special responsibility to preserve and care for them in the light of the global reality now so clear. While there have been some breakthroughs — on PCBs, acid rain, and Lake Erie for example — as well as many border treaties to protect air and water quality and fisheries, they are not enough to offset other damage, both existing and new. Ongoing issues include climate change, over-extraction, non-point pollution, continued high levels of sewage discharge into the Lakes, the loss of wetlands and forests, and invasive species. New issues include gas and oil exploration, including fracking and the export of bitumen from Canada’s tar sands to 17 refineries on the U.S. side of the Great Lakes; new mining operations, including a vast copper and nickel ore deposit that runs from the tip of Lake Superior to Lake Ontario; and possible nuclear waste shipments on the Lakes. So the question must be: why is the crisis growing? With so many wonderful people, elected officials and environmental groups working hard to save and protect the Great Lakes, what is the problem? There are competing visions of what the Lakes are for and who they serve. One vision — the wrong one — is winning. Some see the Great Lakes as a watershed that gives us all life and livelihood and is a living ecosystem to be nurtured, protected and preserved for future generations. But too many others, including some governments, see the waters of the Great Lakes as a huge resource for our convenience, pleasure and profit. 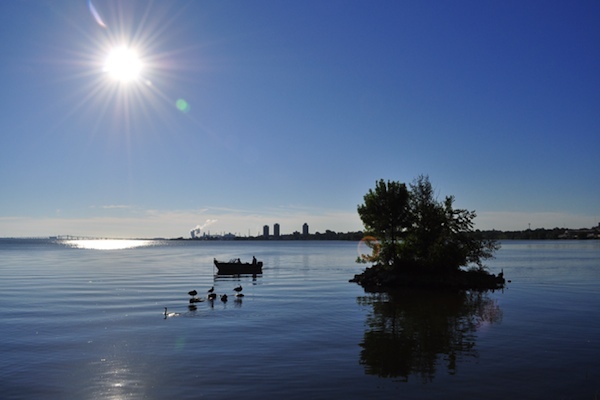 From the building of the St. Lawrence Seaway, to the control of water levels in the Lakes in order to promote shipping and trade, we have predominantly viewed the Great Lakes as an industrial engine for regional growth and prosperity, rather than an endangered watershed. Ontario has its “Open for Business Act” clearly aimed to use its abundant water as an economic incentive to locate business there. Milwaukee City Council is promoting a project called WAVE — Water Attracting Valued Employees — to use the “comparative advantage” of Lake Michigan to attract water intensive industry from the South with special low water rates. We also have the case of chronic under funding — especially on the Canadian side — and inconsistent enforcement of environmental laws and regulations. 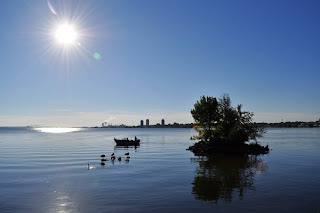 What would happen if the citizens living around the Great Lakes decided to collectively protect them based on the very principles and practices that informed the First Peoples of the region, namely that the Lakes must be shared equitably and responsibly by all who live around them and protected for seven generations to come? My answer: a new narrative for the Great Lakes to replace the current narrative that they serve predominantly as an industrial engine for growth and prosperity, a narrative I hope elected officials, the International Joint Commission (IJC), and ordinary people will embrace. This new narrative would declare the Great Lakes to be a lived Commons to be shared, carefully managed, enjoyed by all, and protected by the Public Trust Doctrine. The Great Lakes could be designated as a bioregion, understanding that while there are many political jurisdictions managing the basin, it is in fact one integrated watershed and must be governed as such. A Great Lakes Basin Commons would respect and understand the fact that many make their livelihoods from the bounty of the Lakes and would not attempt to shut down industrial activity or food production per se. But this new narrative would reject the view that the primary function of the Great Lakes is to promote the interests of big industry, big agribusiness and the powerful to the extent that they get preferential access and are often allowed to break environmental laws. And it would embrace the notion that the Lakes must be carefully managed for the good of the entire community, and that all activity — public and private — would come under strict public oversight and accountability and operate within a mandate whose goals are the restoration and preservation of the waters of the basin and justice for all who live around it. We need a Great Lakes Basin Commons Watershed Plan with basin-wide consistent laws, regulations and definitions to protect these waters as a human right and a public resource, and we need to empower local communities to have a much greater say in all decisions affecting their local watershed. I understand it would require jurisdictional cooperation that many tell us cannot be done; but I argue that if our governments can cooperate for business-friendly trade and perimeter deals, then they can do it to save the Great Lakes of North America! This entry was posted in Water & Food. Bookmark the permalink.